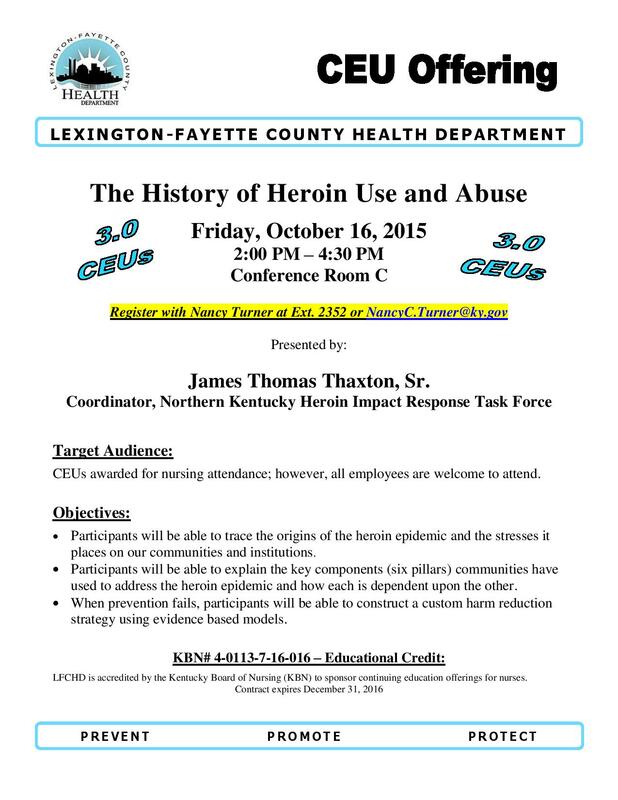 To register for this new CEU opportunity, please contact Mark Johnson at 859-281-5048. Two new CEU opportunities will be available next month. 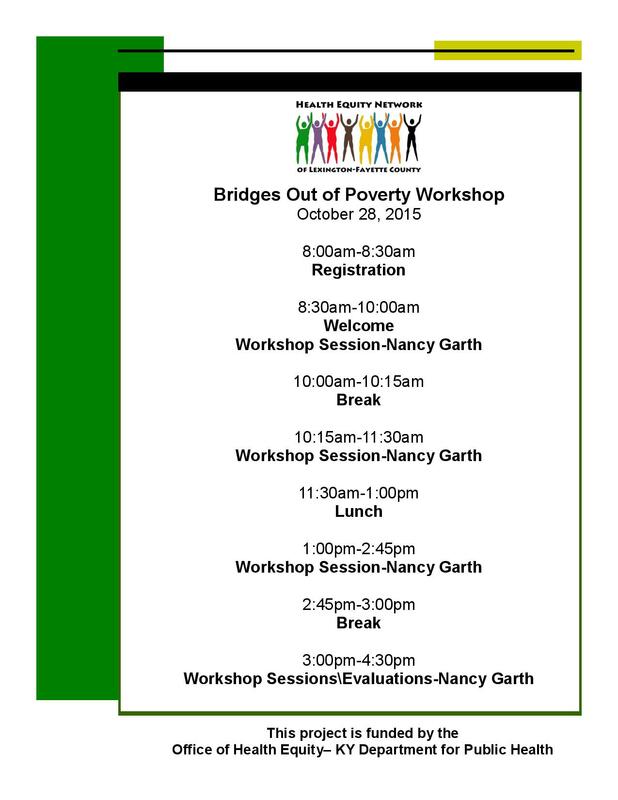 Please contact Nancy Turner (ext. 2352) for information or to register! 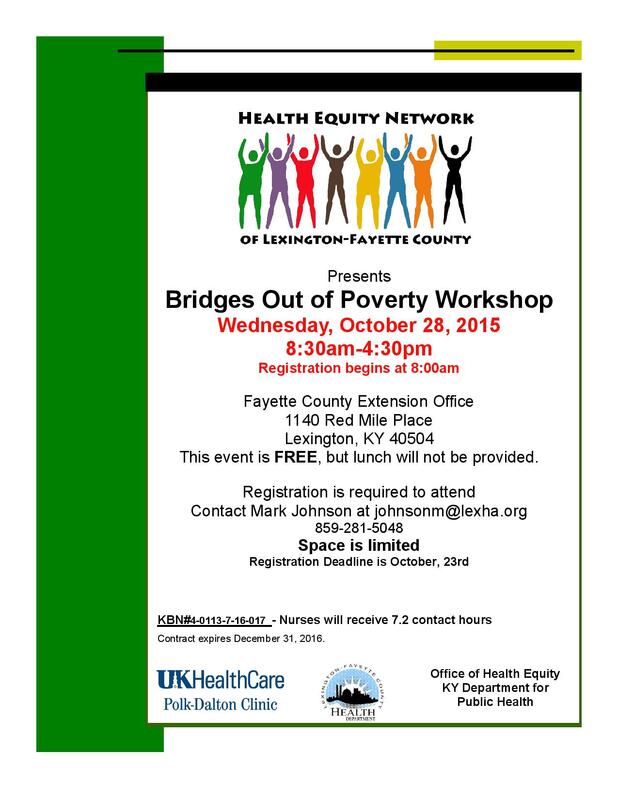 The Lexington-Fayette County Health Department’s Continuing Education Committee is planning two continuing education presentations for October 2015. Nurses can receive up to six continuing education credits — three for each presentation — to be used toward their nursing license renewal at the end of October. 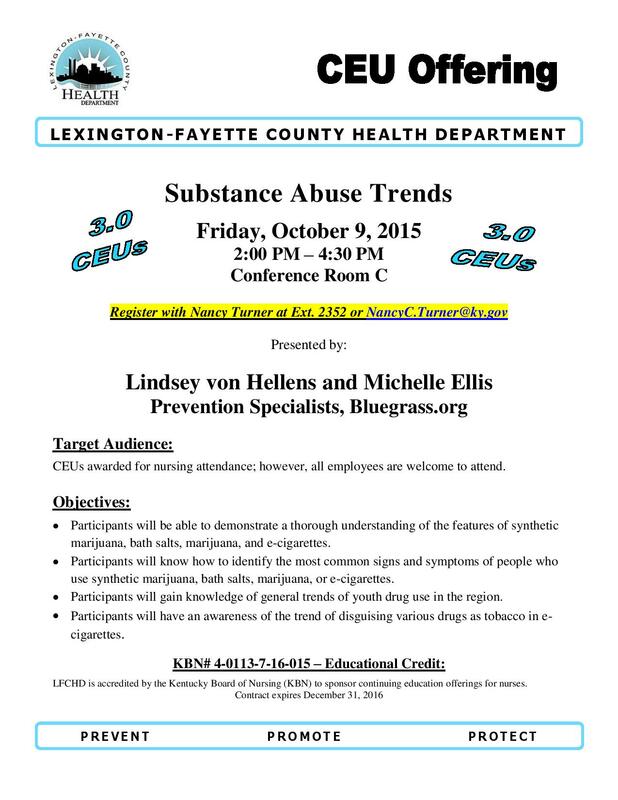 • Substance Abuse Trends: An overview of current trends in drug abuse, street drugs and synthetic marijuana, as well as current slang terms for these drugs.This will be held 2-4:30 p.m., Friday, Oct. 9, in Conference Room C.
• The History of Heroin Use and Abuse: Explore the origins of the heroin epidemic, how communities are addressing the epidemic and the use of harm reduction strategies. This will be held 2-4:30 p.m. Friday, Oct. 16, in Conference Room C.
Please watch your email and Healthy Times for more information! With your help we had eight total successful blood donors at the Bloodmobile Event held Sept. 16. On behalf of Human Resources, many thanks to each participant! We saw seven people, received 72 used needles and gave out 103 clean needles Friday, Sept. 18, at our needle-exchange program. We will open again 1:30-4 p.m. Sept. 25. In total, we have received 915 used needles and given out 386 clean needles in the three Fridays we’ve been open since starting Sept. 4! 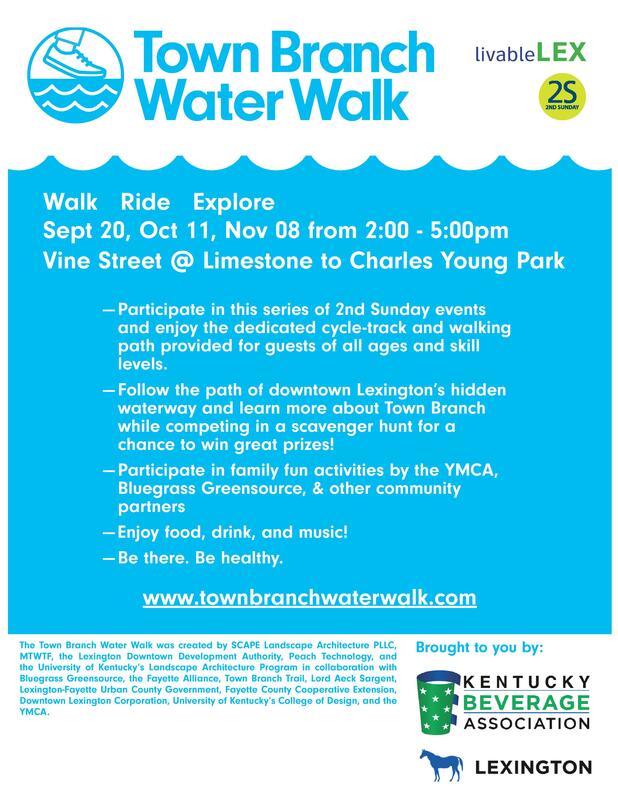 The latest program as part of Lexington’s 2nd Sunday program will be the Town Branch Water Walk 2-5 p.m. Sept. 20! If you participate, remember to contact Ruben Perez (ext. 2410) to find out how you can get Wellness points! A new banner featuring the names and handprints of the LFCHD staff who planned and operate the needle-exchange program will soon hang in Corridor C.
Using the blue and green colors featured in the NEP’s logo and outreach material, employees left their handprints to show the teamwork that went into designing, building and launching this program. We saw six people, received 584 used needles and gave out 113 clean needles Friday, Sept. 11, at our needle-exchange program. We will open again 1:30-4 p.m. Sept. 18. In total, we have received 843 used needles and given out 283 clean needles. 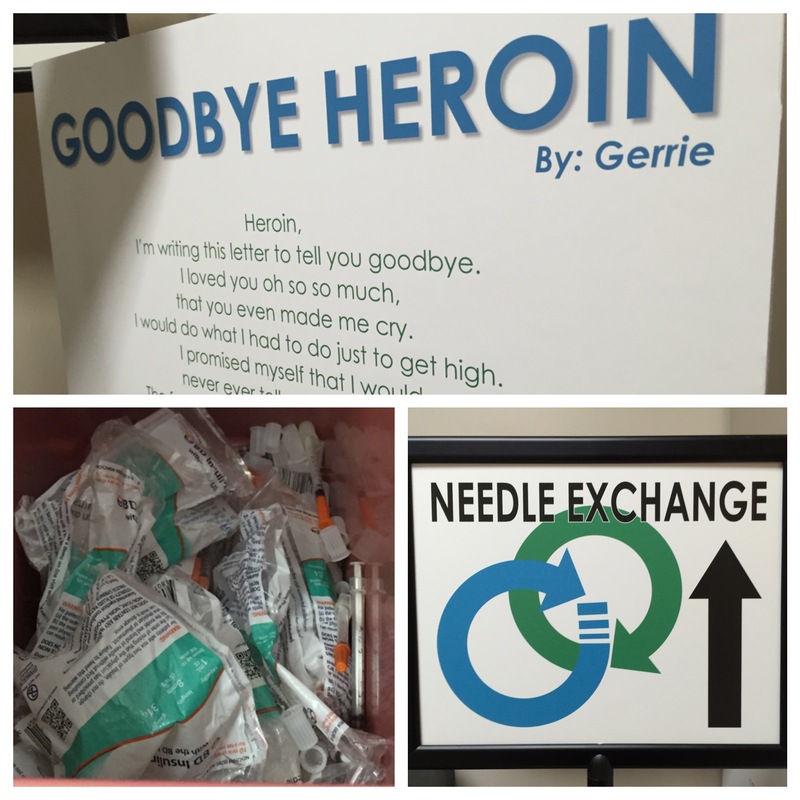 The Lexington-Fayette County Needle Exchange Program will not accept needles from diabetic patients. 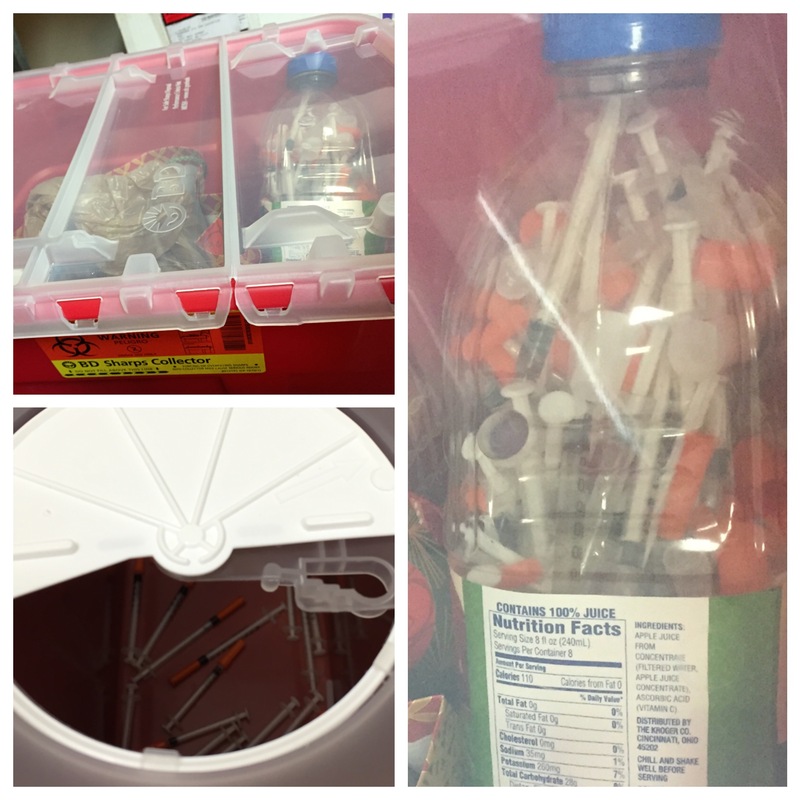 We realize the need for these patients to dispose of their used needles and have learned from the city that these needles can be put in the regular trash if they are sealed in a heavy plastic or metal container such as a coffee can or similar plastic container. We urge patients who need to dispose of needles used for insulin to do so according to acceptable city procedures. LFCHD employees took part in a CPR class Friday afternoon for non-clinical workers who want a “layperson” understanding of basic life-saving information. The Safety Committee had previously discussions about the AEDs (automated external defibrillators) located throughout the building and how some are in spots where no employees know how to use them. AED instructions are included in CPR certification classes, which are only required of nursing employees. Nurses, however, aren’t located in all areas of the building. The health department is offering CPR classes for non-clinical staff to ensure there will be at least 1-2 people in all areas who are CPR-certified and know how to use the AED in the event of a medical emergency requiring CPR. Carla Basanta will be scheduling another class for those employees who missed Friday’s class.